On the tour you will explore the iconic Golden Circle and afterwards unwind as you soak in a genuine Icelandic hot spring! On our first stop we retrace the footsteps of ancient Vikings by visiting the Þingvellir National Park. This is where the early settlers established the country´s first national assembly in 930 AD. Þingvellir is also where the American and Eurasian continental plates are dramatically pulling apart at an annual rate of 2 cm. It’s also where the country´s largest natural lake is to be found, Þingvallavatn. ​​From there we move on to see the world famous Geysir – where the ground trembles and steaming hot water spouts spectacularly skywards from the famous Strokkur Geyser every few minutes. ​Our last stop is the dramatic Gullfoss Waterfall, a breathtaking sight to behold. Here a powerful glacial river cascades down 32 meters on two levels into a deep narrow canyon with a thunderous roar. The last stop on our tour, and the most relaxing, is the Secret Lagoon. Whatever the weather it´s the perfect spot for relaxing in between sightseeing and enjoying Icelandic nature at its very best. Indeed, the geothermal hot water is a hidden treat that Icelanders have been enjoying for generations! Around the Secret Lagoon you find several hot spots. 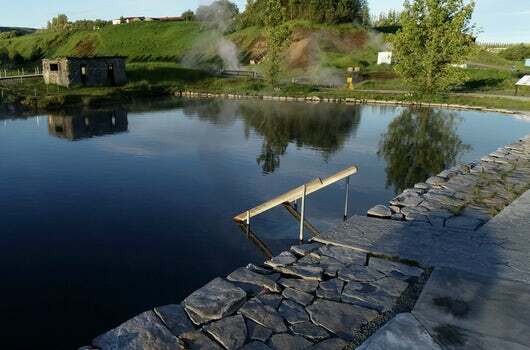 A path has been built so you can have a closer look at the bubbling hot springs and a little Geysir even erupts every 5 minutes, showing off for the guests bathing in the hot spring. ll in all – it’s the perfect combination of activities. Stunning, must-do sightseeing, and a heavenly bathe in a geothermal hot spring set in a gorgeous location! Starting off in Reykjavik from our Reykjavik terminal at Skógarhlíð 10 we will depart for Þingvellir, a 45-60 minute ride. 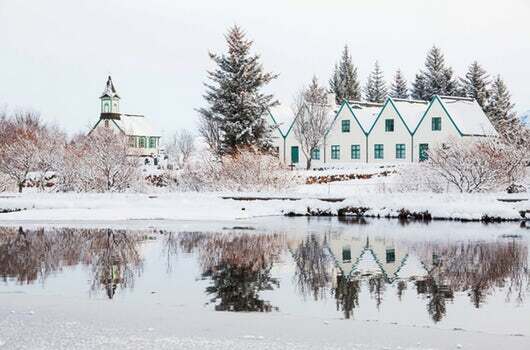 The tour starts with Þingvellir National Park, the UNESCO World Heritage Site. Here you walk down the path into a rift valley and admire the view while learning about Icelandic history. The next stop is at Geysir Hot Springs, the home of the one-and-only original geyser and Iceland’s most iconic natural attraction. Steaming hot water erupts from the famous Strokkur Geyser every few minutes. The Gullfoss Waterfall, an awesome sight to behold, is the next stop. Here a powerful glacial river cascades down 32 meters on two levels and into a narrow canyon with a thunderous roar. A short 30 minute ride brings you to the Secret Lagoon, where you will have about 2hrs to enjoy the relaxing waters of this natural hot spring pool. We then drive you back towards Reykjavik to our Reykjavik Terminal. If you booked a SmartBus pickup, you will be taken back to your place of stay from here. Bring with you: Bathing Suit! Dress according to weather. In Iceland it is always wise to dress in warm, waterproof clothes. Weather changes can be sudden so expect the unexpected. Bring a waterproof jacket and pants, headwear and gloves. Good outdoor shoes are recommended. Swimsuit and Towel. These may also be rented at the secret lagoon.